In this collection of lively essays, Cynthia Enloe makes better sense of globalization and international politics by taking a deep and personal look into the daily realities in a range of women's lives. She proposes a distinctively feminist curiosity that begins with taking women seriously, especially during this era of unprecedented American influence. This means listening carefully, digging deep, challenging assumptions, and welcoming surprises. Listening to women in Asian sneaker factories, Enloe reveals, enables us to bring down to earth the often abstract discussions of the global economy. Paying close attention to Iraqi women's organizing efforts under military occupation exposes the false global promises made by officials. Enloe also turns the beam of her inquiry inward. In a series of four candid interviews and a new set of autobiographical pieces, she reflects on the gradual development of her own feminist curiosity. Describing her wartime suburban girlhood and her years at Berkeley, she maps the everyday obstacles placed on the path to feminist consciousness—and suggests how those obstacles can be identified and overcome. The Curious Feminist shows how taking women seriously also challenges the common assumption that masculinities are trivial factors in today's international affairs. Enloe explores the workings of masculinity inside organizations as diverse as the American military, a Serbian militia, the UN, and Oxfam. A feminist curiosity finds all women worth thinking about, Enloe claims. She suggests that we pay thoughtful attention to women who appear complicit in violence or in the oppression of others, or too cozily wrapped up in their relative privilege to inspire praise or compassion. Enloe's vitality, passion, and incisive wit illuminate each essay. 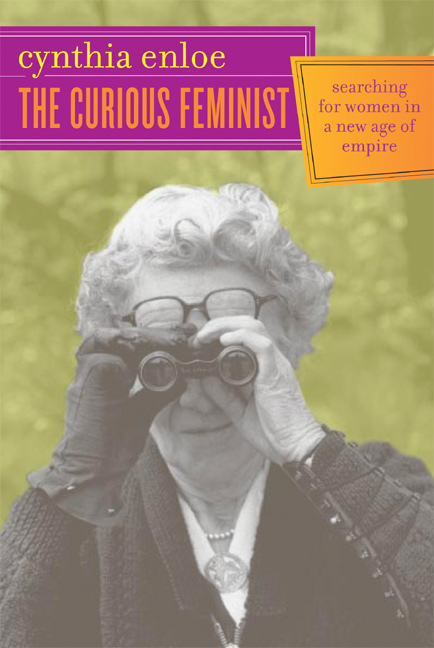 The Curious Feminist is an original and timely invitation to look at global politics in an entirely different way. Cynthia Enloe is Research Professor of Women's Studies and International Development at Clark University. She is the author of Bananas, Beaches and Bases: Making Feminist Sense of International Politics (2001), Maneuvers: The International Politics of Militarizing Women's Lives (1999), and The Morning After: Sexual Politics at the End of the Cold War (1993), all from California. Cynthia Enloe won the Howard Zinn Lifetime Achievement in Peace Studies Award from the Peace and Justice Studies Association (PJSA). 5. Whom Do You Take Seriously? 19. Updating the Gendered Empire: Where Are the Women in Occupied Afghanistan and Iraq?